If you are like most dog owners, this thought has crossed your mind once or twice. 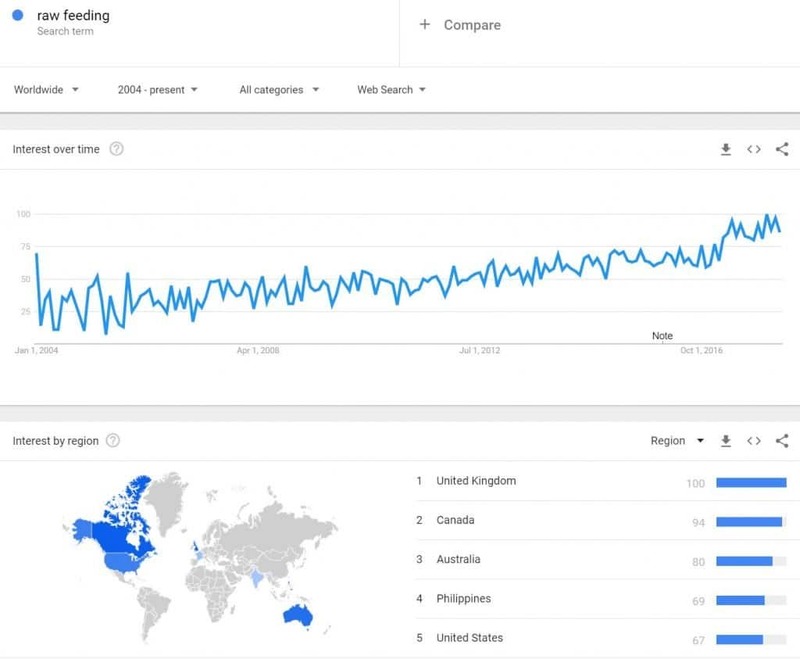 In fact, if we look at this Google trend data from 2004, the volume of people searching for “raw feeding” has almost quadrupled! And if you tease out the United States, the increase in dog owner interest in raw feeding over the last three years is striking. Whether your interest raw feeding is a mere vague curiosity or steadfast determination to get off the kibble train, what these data show is that you are not alone. After writing several articles on the topic of dog food and raw feeding, I have come to realize there is a significant gap in the marketplace for simple, actionable information for dog owners who are considering a transition (or partial transition) to a raw diet for their dogs. 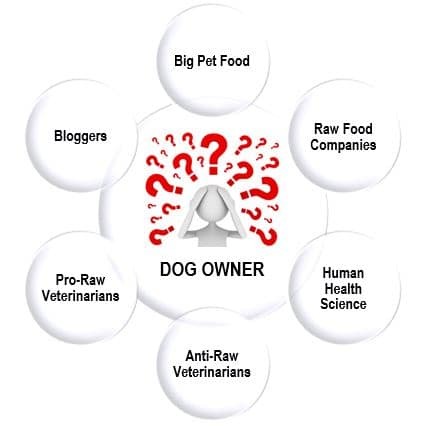 As I stated in my last article, Raw Dog Food: The Myths, Facts, and Future of Raw Feeding for Dogs, the market is made up of essentially two camps; kibble feeders and raw feeders. I would argue that at least 80% of dog owners (and 100% of my Big Dog Mom dog owners thank you very much), care deeply about the quality of the food they are feeding their dog. So whether they are choosing a “high quality” kibble, a fresh, natural diet (raw, home cooked, commercial raw, etc. ), or some variation of the two, dog owner’s care and want to choose the very best food they can afford to nourish their canine companion. Unfortunately, finding information that doesn’t confuse, over-complicate, or belittle a dog owner who is researching raw feeding for the first time is hard to come by these days. I met Scott Jay Marshall II, a.k.a. Dog Dad, last year through his Facebook group, Raw Feeding 101 – Learn to Feed Raw and have been impressed by not only his knowledge about raw feeding, but his supportive and inclusive approach with which he runs his business. Scott is a veteran raw feeder of two beautiful German Shepherds, Horus and Wolken, and has dedicated his life to empowering fellow dog owners by teaching them the basics of raw feeding. Because many of you may be unfamiliar with Scott, I decided to leap waaaaayyyy out of my comfort zone, and put my interview with him on video. I would LOVE to know what you think about this format for Big Dog Mom. *FREE Raw Feeder’s Guide to Preventing Cross Contamination: In response to the overwhelming number of dog owners who are concerned about bacteria in raw food, I created a one page PDF with some simple, actionable tips for a safe and sanitary raw feeding home. Raw Feeding 101.com – This is the link to Scott’s beginner course for new raw feeders. While I am an affiliate for the course, I NEVER recommend anything I wouldn’t buy or use myself. Dog Dad Official on You Tube: Scott has a plethora of raw feeding videos and does a weekly You Tube LIVE on Tuesday evenings where he answers questions from viewers. And if, by chance, you liked this video and would like to see more BIG DOG focused videos in the future, please SUBSCRIBE to Big Dog Mom on You Tube and let me know. While I can’t promise the Legos and dog hair will always be cleaned up, or that I won’t have slobber on my clothes, I can promise to always make the most of the time and attention you give me. You are right – the information out there for those who would love to do it ourselves is confusing! I currently am a mix of raw and high-quality kibble feeder. Each pet needs something different. I also had not been in a place to prepare all meals myself but I am close to being there! This article helps TONS! Thank you! That’s wonderful, Joely! Thank you! When I first started out, I read a lot of conflicting info from various sources. It’s nice that there’s more places people can learn about raw feeding these days. It seems complicated at first but once you learn, it’s pretty easy. I couldn’t agree more. Part of the problem is the sheer volume of information out there on both sides, much of which is either designed to confuse or simply over-complicates raw feeding unnecessarily. It’s sad because, like you said, it really is pretty easy. My biggest concern with raw feeding would be bacteria or other contaminants that (supposedly) go away with cooking. Thanks for the PDF addressing this! You are more than welcome! I hope it puts your mind at ease. I have been raw feeding for several years without incident and with kids and mastiffs, I certainly don’t live in a sterile environment. You know what makes feeding dogs a rocket science? Feeding them things they were not meant to eat. That’s why the commercial dog foods need all the feeding trials and all that. I mean, why would you need to test whether a dog can survive, say on fresh whole rabbit diet? They survived on that for centuries. If you want, though, have the food contain mostly grains and things that have not been proven by evolution, then you need to test the living daylights out of it just to prove they dogs will survive. Great article about raw feeding! I have been researching it lately and have been confused by the abundance and sometimes contradictory information on the internet! I really like your PDF about preventing cross contamination as that has been one of my concerns. Wonderful! Thank you, Rebecca! Please let me know if you have any questions. I’m always happy to help. I remember looking into raw food several years ago, because I considered trying my cats on it. I admit I found the information so confusing I gave up the research and went to a pet supply store that sold “good quality” diets, and raw food. I’m afraid she wasn’t terribly helpful, I went home with a couple of frozen samples, tried to feed it to one of my cats and she walked away. That was my experience so thanks for such an informative post. We raw feed our dogs, like the US it is becoming more popular in the UK, thankfully I think. At first I was confused by all the information and put off with all the correct percentages of meat, bone and offal. However, there are companies here in the UK that do all that for you and make it so much easier, it comes frozen and with the correct amount of what is needed and is completely organic. Real raw feeders would probably say this isn’t raw feeding, but our dogs are healthy, have beautiful coats and love the food, there’s no problem with them eating it at all. So that makes me happy too! That is wonderful, Michelle! I would give anything to have someone just pre-weigh and balance my food. The prep everyday is what takes the longest. The challenge is cost when it comes to pre-prepared raw for me. Mastiffs are just too big and eat way too much to ever make this feasible. I wonder what the giant breed owners do in the UK? 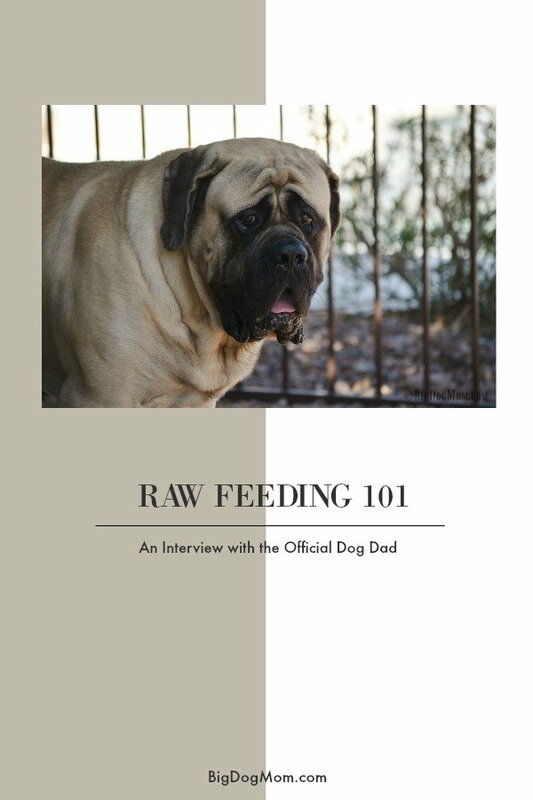 What a great resource for those looking to feed raw or just getting a new perspective on feeding raw for dogs. I’ll be pinning this post for my dog parents. Love that you posted your video! It’s a great format and adds a more in-depth layer to your posts! I enjoyed seeing your big dog hanging out in the background too 🙂 Congrats on being named BlogPaws Nose-to-Nose finalists! What an honor! Hope to see you there! You are a natural in front of the camera! Love the dogs being part of the interview and the interview information itself. You have become my go-to reference for raw feeding because of your guilt-free and two sides of the same coin-just wanting to be good pet parents philosophy. I like the video format and subscribed to your YouTube Channel with Talent Hounds (although rather a long video- I’ll be interested to hear your watch times and drop off). How did you film both you and him and edit the interview? Great that he could follow his passion for dogs and diet. See you at BlogPaws. Thank you so much, Susan! I need to check my stats on the video. I’m still learning You Tube and trying to figure out how to set it all up. All of my other videos on there are short ones that I have put on there just so I have a link to embed on my blog post. I never gave much thought into setting up a legitimate You Tube channel like yours. Great post. Healthy, fresh food is the foundation of good health. There was a point my head was spinning because I was learning TOO much and started to doubt everything. Now, I just go on my merry way, add more information and tips as I continue to learn, but don’t stress over it. Thank you, Tonya! I feel very much the same way. I learn something new everyday; some things I choose to incorporate, some I hold off on. But you are right, there is no need to add stress to your life about this. It really should be something that serves to enhance your relationship with your dog, not taint it. Thank you for including these references for raw feeding. we are not kibble feeders either (semi raw+chicken and rice), but raw feeding is something i need to look up and see if it will be good for Babu. I like that you discuss learning what info is out there, and not to be condescending to people who are learning the process. I’m very happy this option is becoming more widely discussed. I know some dogs and cats are thriving on raw diets. I’ve also read a few cases of people who have had to put their pets on kibble because raw wasn’t working out for the animals. It is funny how we don’t question our ability to feed ourselves, but second guess what we feed our pets all the time. Oh, isn’t that the truth, Beth! When I was going back and forth with Junior and really struggling internally with feeding kibble again, it occurred to me how little thought I give to my own diet. I am also always so concerned about the bacteria in the meat. I am sure this pdf will be so helpful to pet owners who are ready to start feeding raw and want to make sure they do it properly. I sure hope people find it helpful! Thank you, Monika! It’s important to add that some dogs will refuse raw. That was our case. My dog will not. No matter what. Under any conditions (we certainly tried everything) eat raw. He is not food driven at all. He literally would rather not eat. And at 3.5 pounds there are only so many missed meals we can go through before the sugar levels drop and we are in trouble. His favourite treat is spinach leaves for crying out loud. So we make his food. Freshly made … 2 a day. While I haven’t heard of this happening much, I’m sure you are right. I’m sorry your boy didn’t like raw. Sometimes it’s a matter of playing around and finding a raw food they do like. For such a small dog, there are a plethora of commercial raw foods that would be easy and economical I think.